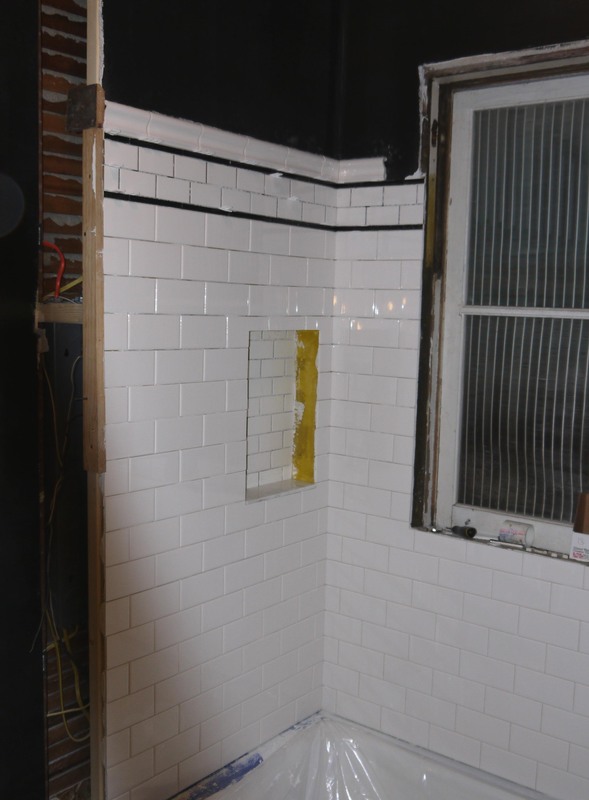 The walls were nearly all tiled, just the trim pieces missing along the top, and of course that pesky wall niche. But more on that later, as I couldn’t make up my mind how I wanted to trim it out. 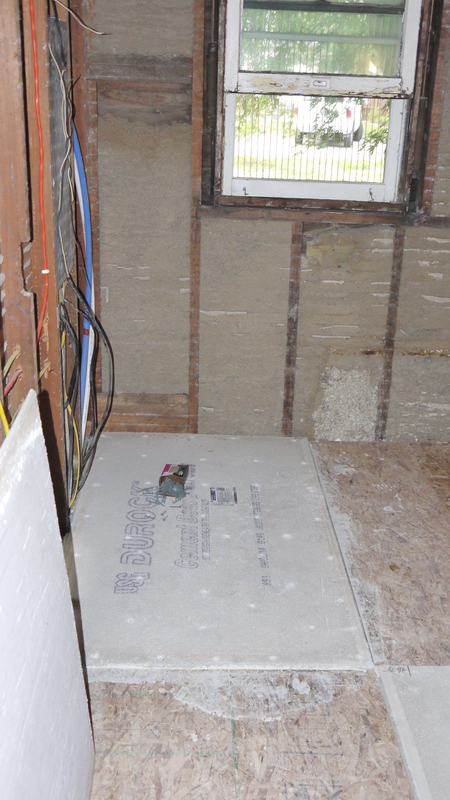 So it was time for the floor. I sketched out a pattern for the floor that I thought would complement the walls. 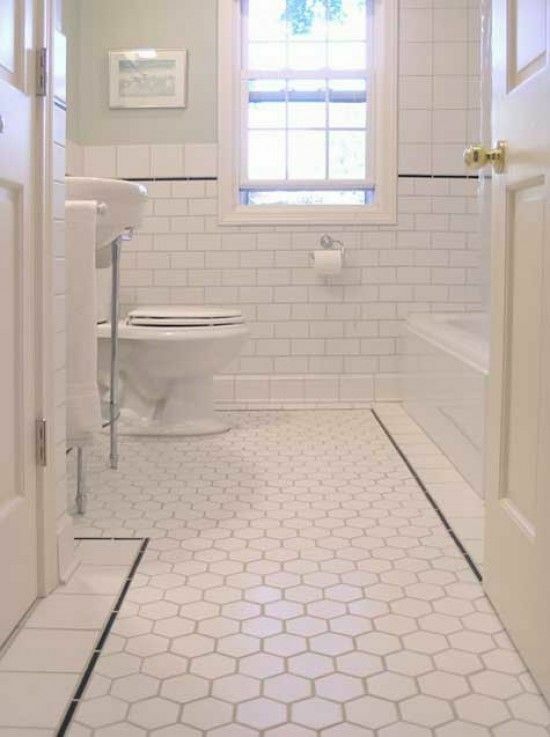 I knew I wanted white hexagon tile, but I liked how many of the period bathrooms I saw had a black border around the edge, either in black hexagons, little stars, or a solid stripe. In the name on consistency, I used the same narrow black lines that I used on the walls, only a single black line rather than a double. 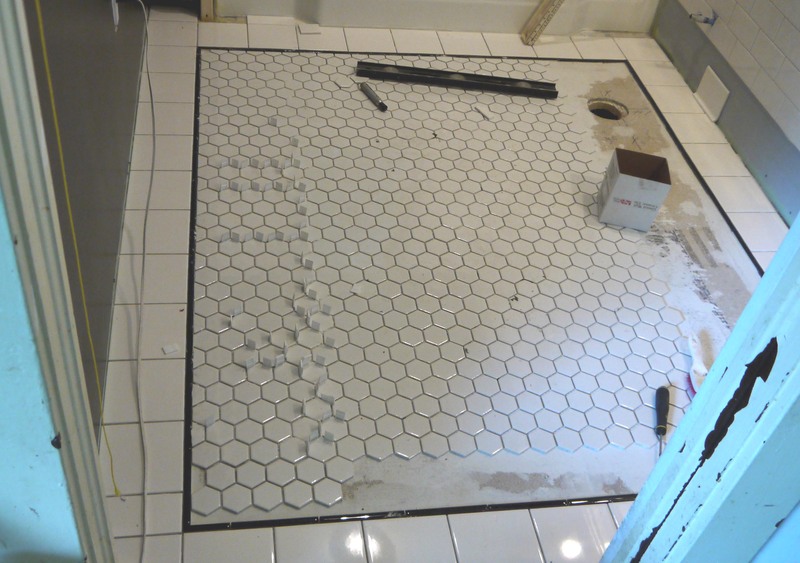 I started with a 6″ square all around the room and flat up against the tub, then the skinny black liner tile, and then filled in the center – about 5 ft x 5 ft – with the white hex. While the border pieces went down 1 at a time, I thought the center field would be faster because the hex comes in 12″ sheets with the tiles glued to a mesh backing. But once again I made it more difficult on myself in an effort to ensure the final result looked like a professional installation. 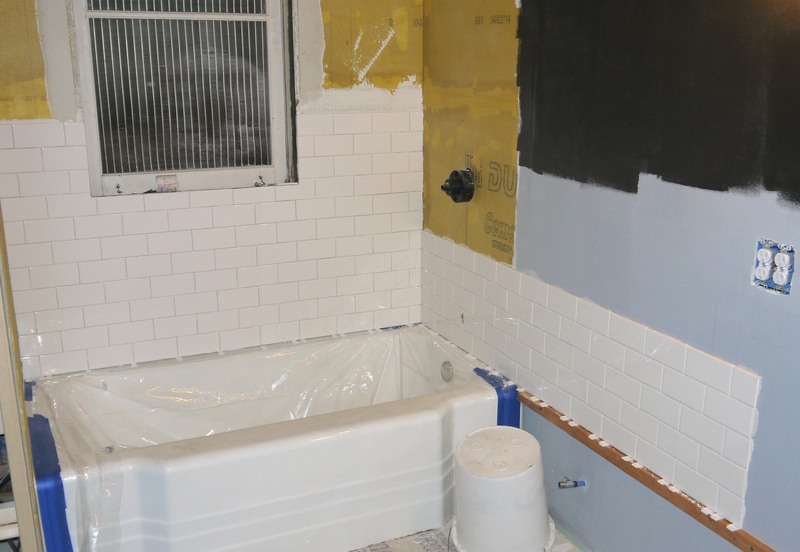 In my weeks spent searching inspiration photos on Pinterest and Google, I’ve come across too many bathrooms where intentions were great – but execution was less than impressive. 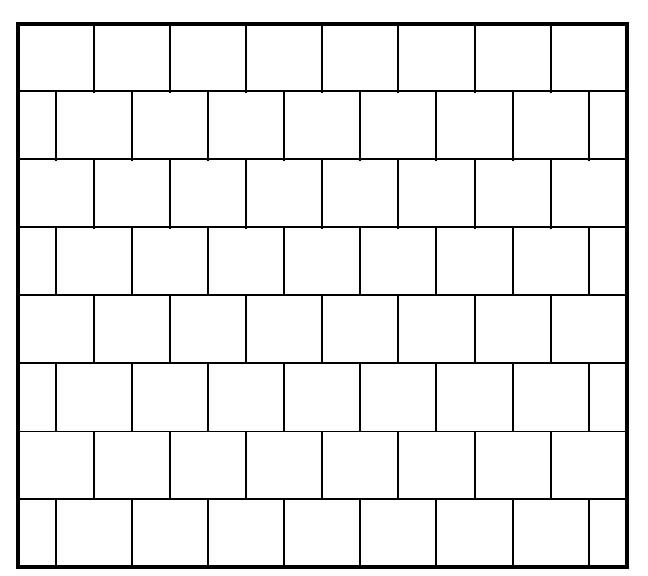 Below is just one example – notice that line where each sheet starts and ends? I vowed not to let that happen. 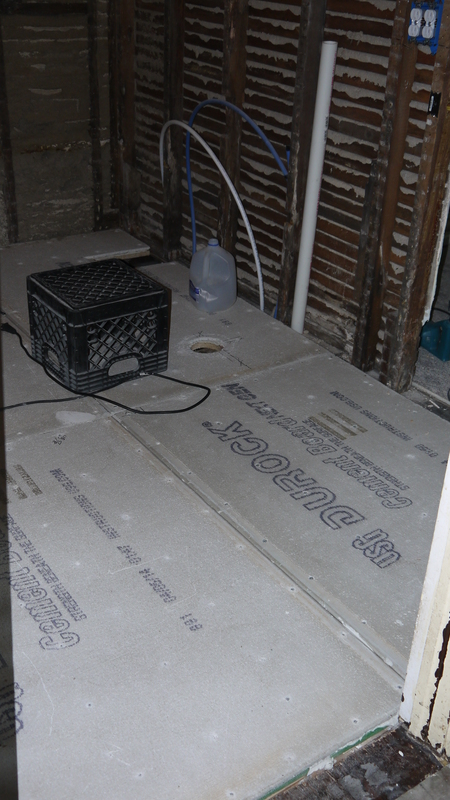 So my solution was to cut the first sheet of every 2nd row in half and lay the sheets across the floor the way one might lay brick – in a running bond pattern. 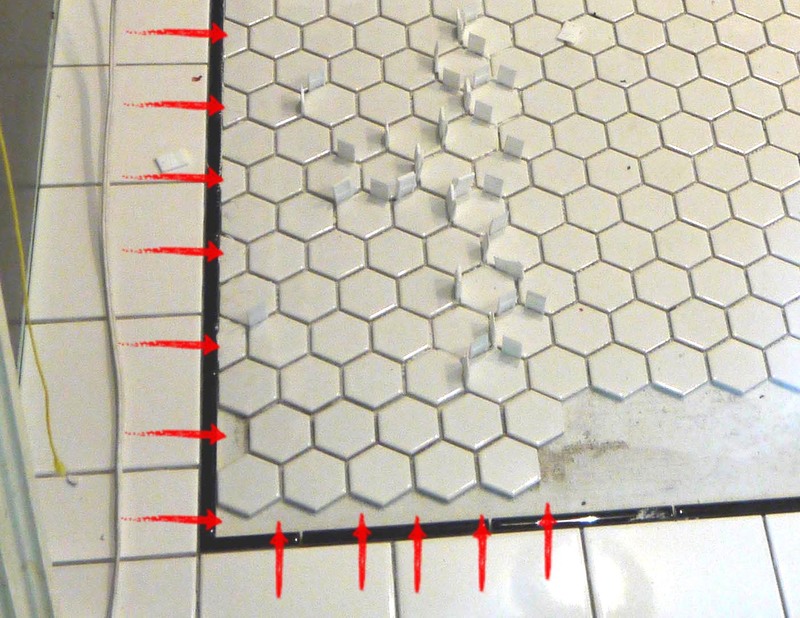 And although the tiles are glued to a mesh, the spacing between the tiles still wants to vary. 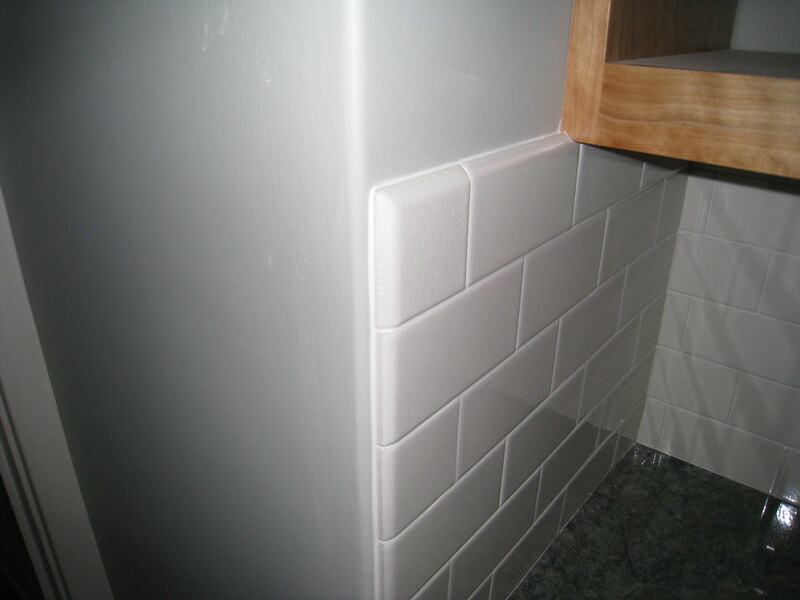 It took constant eyeballing the lines and watching for any spacing that looked too thin or too wide. 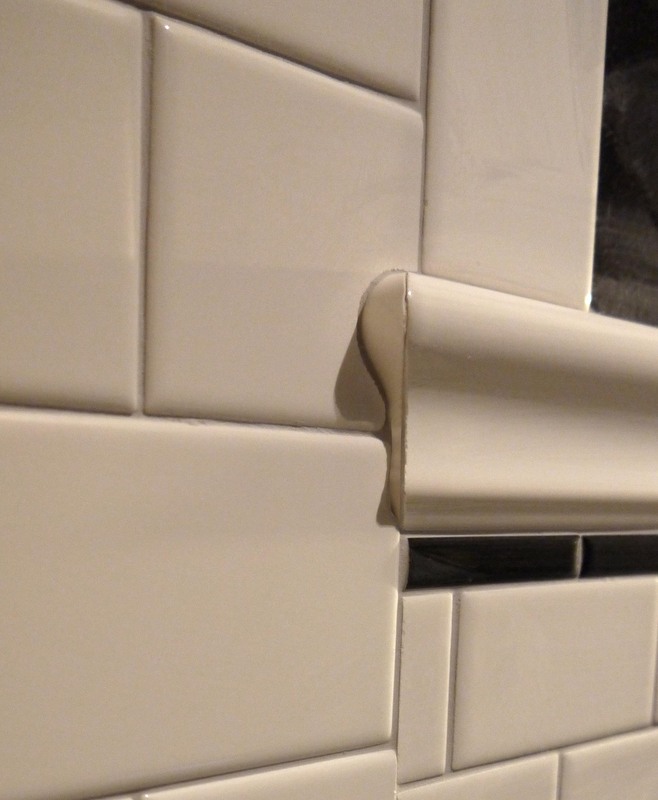 And I still used a ton of 1/8″ plastic spacers. 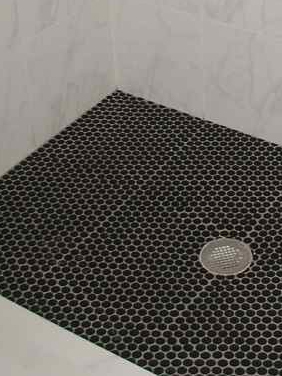 But those tiny slivers to finish the floor? Pretty sure every other finger has been cut trying to push those tiny pieces through the wet saw. I was glad when the floor was finished. 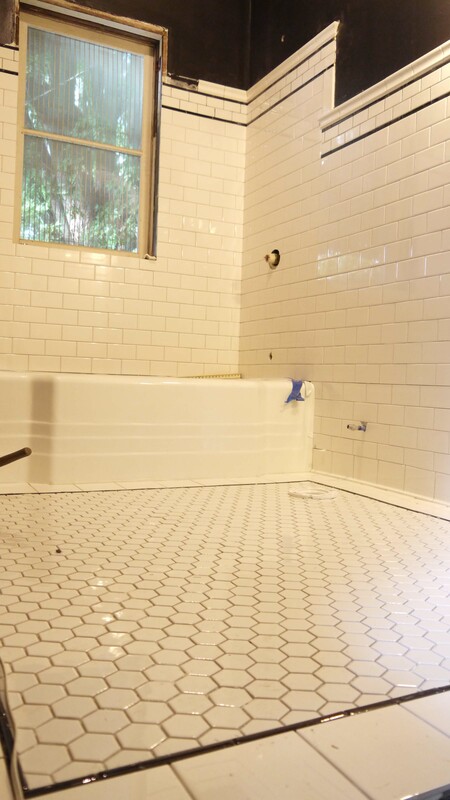 Speaking of injury, this tiling project has been cruel. 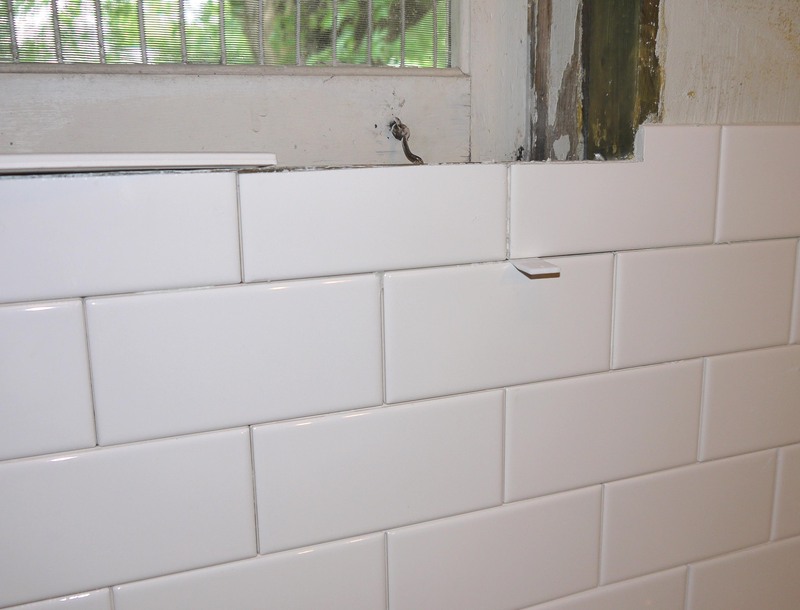 Cut hands and fingers on sharp tile edges; tiny little tile chips from the wet saw stick to my arms, but don’t try to brush them off – more cuts like little slivers of glass; like dozens of little paper cuts! And then there are my knees. 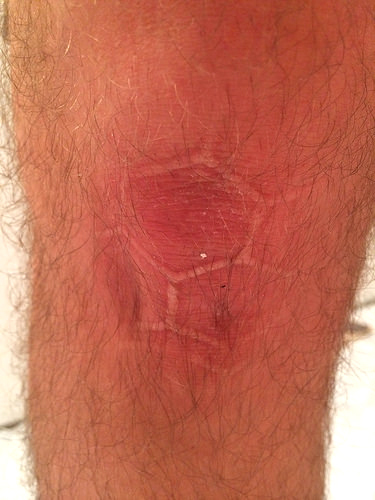 By the time I finished, I wish I had invested in a quality pair of knee pads. Lesson learned for the next flooring project. 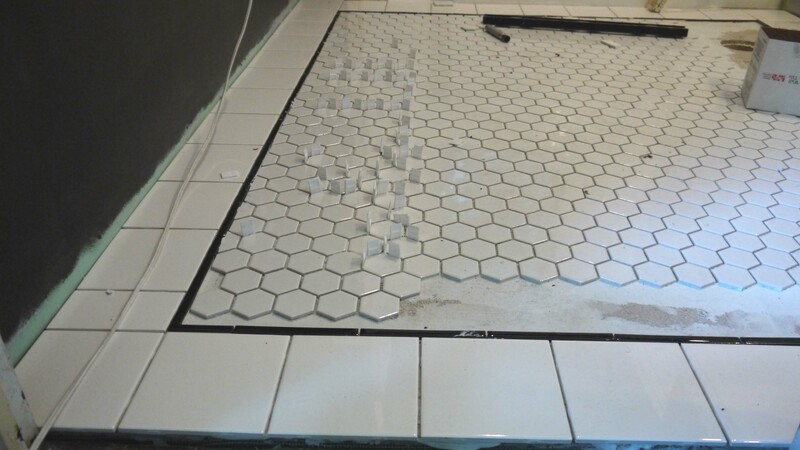 Check out those hexagons! But in the end, the result was worth all the blood, sore finger tips, and smashed knees. 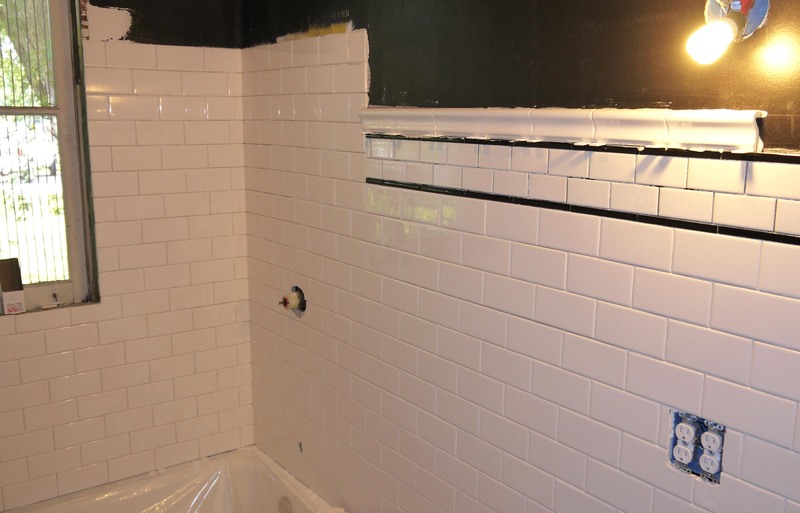 As my neighbors described it over the weekend when they stopped by for a progress tour, “it looks like a charming historic hotel bathroom!” My goal all along has been something that looks “timeless.” I want anyone who sees it to wonder if it’s the home’s original bathroom. By the way, I have some awesome neighbors who are super friendly and invite me over for homemade ice cream… #homebuyingscore. About the missing pieces of trim cap beside the window opening – because I don’t have a window installed yet, I don’t know exactly what size this final piece on either side of the window will be. I’m going to leave it off until the window is installed. 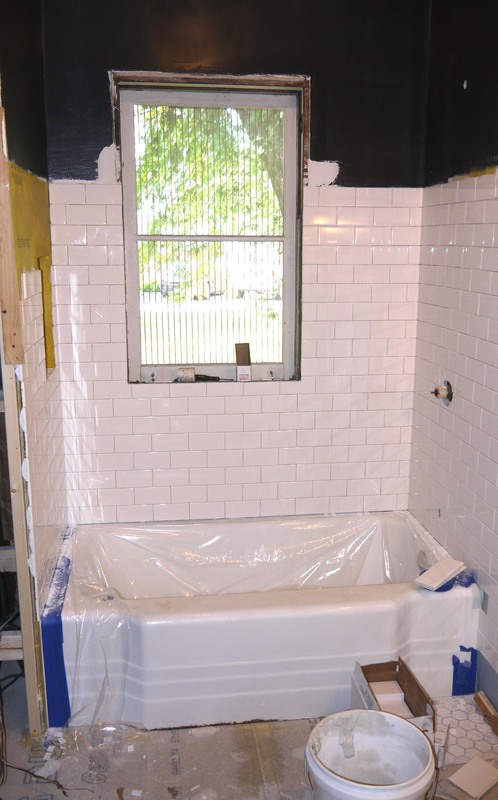 Then I can tile the inside of the window return and know precisely where the tile will end into the woodwork which will wrap the upper portion of the window opening. 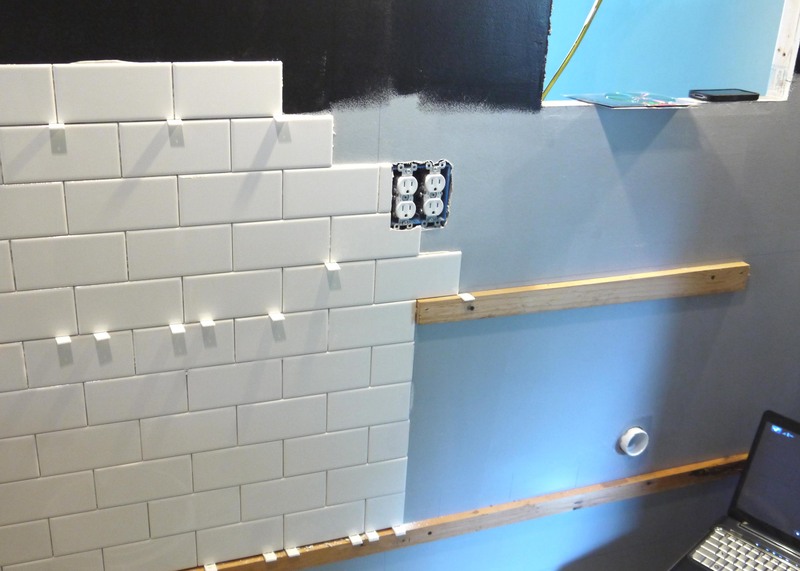 But I can’t wait on the window to get here, so I’m moving on to grout!